Water lily or Shapla is an aquatic plant which has round disc-like leaves and it floats on water. It is native to southern and eastern parts of Asia and they are national flower of Bangladesh and Sri Lanka. Its flowers have long tuberous stalks and stand high above the water level. The flowers come in violet-blue, purple, mauve or fuchsia coloured but white colored water Lily is mainly available in Bangladesh and India. It grows abundantly in water bodies like pond, small lakes but because of its beautiful flowers it is considered as an ornamental flower too. 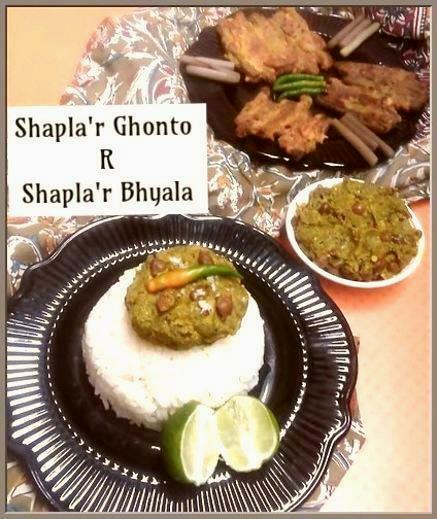 In Bengal, eastern part of India and in Bangladesh, the water lily or shapla flower stalks are used as a vegetable and are made varieties of delicacies with it. Even flowers are eaten as a fritter. It is very healthy just like taro roots or kachur loti. It is full of iron and other healthy minerals. You can find this all year round but during monsoons they are found in abundant. 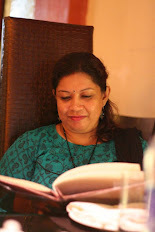 I'll share two recipes using shapla or water lily stalks today, one of them I found in my blogger friend Sayantani's blog, "A Homemaker's Diary". 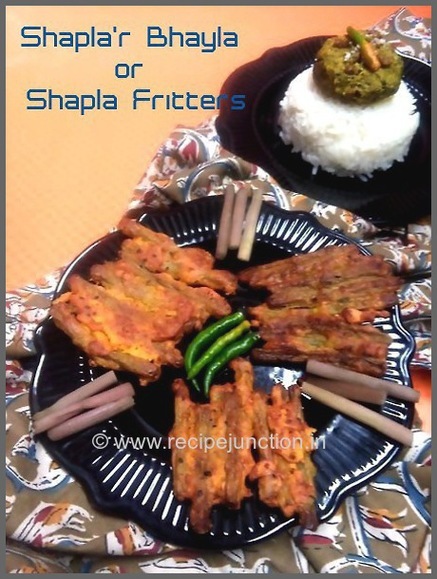 1) Shaplar Bhyala, a raft shaped fritter with water lily stalks and 2) Shapla Ghonto, which I cook very often, where stalks are blached, mashed and cooked with mustard paste which has both vegetarian and non-vegetarian version. Imp. 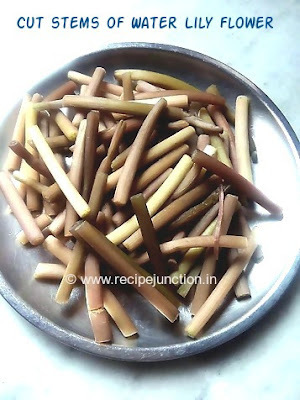 : The water lily stems/stalks are very long and tender and cooks very fast. How to Cut the stalk/stems: you have to take out the fibrous skin from the stalks. For that, Just slit a small part from the thick end of the stalks and pull it down to remove the fibrous skin all along the stalks. Then cut into desired sizes. A raft(bhyala) shaped fritter with water lily stalks, dipped in mustard seed paste and then in a rice flour batter, fried till they are soft but crisp. Water lily stalks/stems : 4-5 nos. Mustard paste : 1 tsp. All Purpose flour : 2-3 tblsp. Rice Flour : 4 tblsp. Green chilli paste : 1/2 tsp. Nigella/black cumin seeds : 1 tsp. Baking soda : 1/4 tsp. 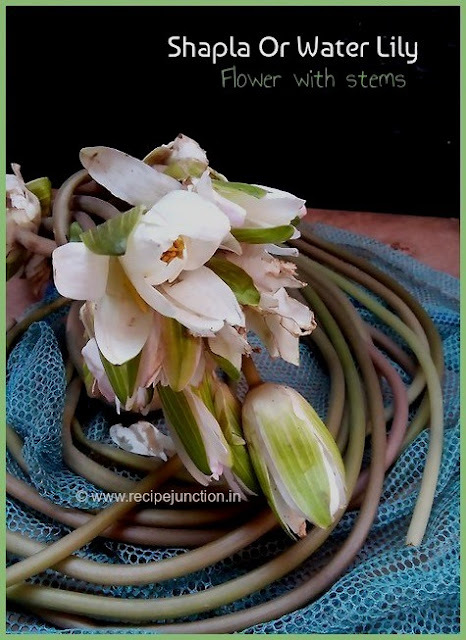 Take out the fibrous skin of the flower stems or stalks as mentioned before. Then cut in 2-21/2 " long pieces. Try to cut all in same sizes. Arrange the cut pieces side by side and insert a toothpick through the center and give it a shape of raft[refer the pic]. Prepare the others same way and keep aside. Now make the batter for frying. Mix flour, rice flour, nigella seeds, a pinch of turmeric powder and salt to taste, add enough water to make a thick consistency of batter. Just before frying, add baking soda. Prepare another mix, by mixing mustard paste, green chilli paste, a pinch of turmeric powder and a little water. We will dip the raft first in this mix and then in flour batter. Heat a frying pan, add enough oil for semi-deep frying, dip one raft in the mustard paste and then in flour batter, coat well and drop it in the oil. Do it 2-3 at a time. Fry till they are nicely fried from both sides. Rest fry in similar manner. 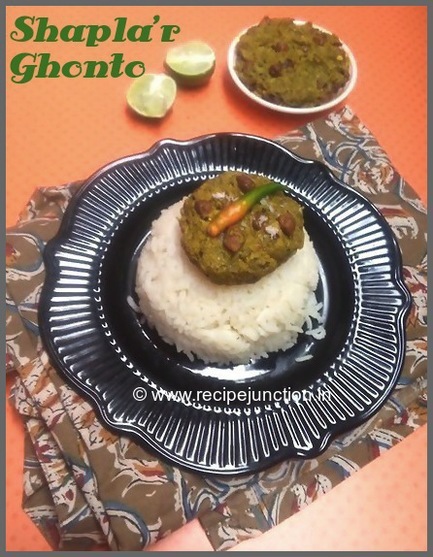 Enjoy as a side with rice and dal. A mashed up shapla stems are tempered and spiced up with mustard paste. Shapla stems : 3-4 nos. Black Cumin seeds : 1/2 tsp. Mustard ssed : 1 tblsp. Mustard oil : 1 tblsp. Prep1 : Soak the black chickpeas in water overnight or in boiling water for 4-5 hours till they are soft. Prep2 : Take out the fibrous skin of the flower stems or stalks as mentioned before and cut the stems as mentioned in other recipe. Wash and in a bowl of hot water, blanch them for 10 minutes or until cooked. When done, drain and let them cool. When stems are cool, mash them well and discard all the moisture. Prep3 : Make a paste of mustard seed, 1 green chilli and a pinch of salt. Add 1 tblsp. water to it and keep aside. Cooking : Heat oil in a pan, temper with black cumin seed and 1 slitted green chilli. Now add soaked black chicken peas and saute for a minute in the oil, now add mashed shapla stems into the oil. It will leave more moisture. When moisture evaporates, add turmeric powder and salt and saute some more. Then add mustard paste and sugar into it. Keep stirring. Season with salt if needed and mix everything well. You can add a little water if you think it needs to cook a little more otherwise no need to add water. Remove form heat. Enjoy with hot rice. 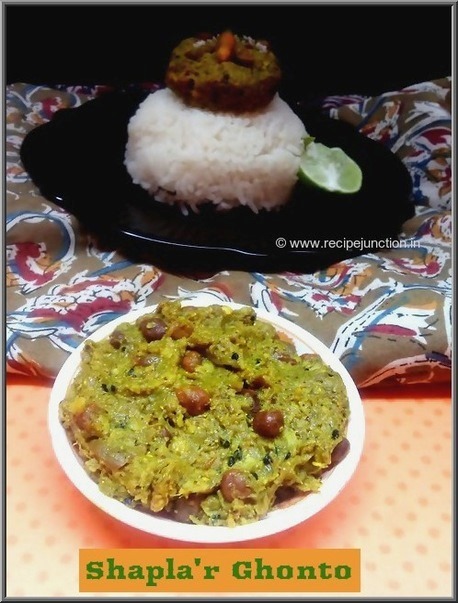 For a non-veg version, you can add fried small prawns or fried and crushed fish head into it. It tastes divine with shrimps. Just add after all the moisture from shapla is evaporated in the pan. Check this link for non-veg version.